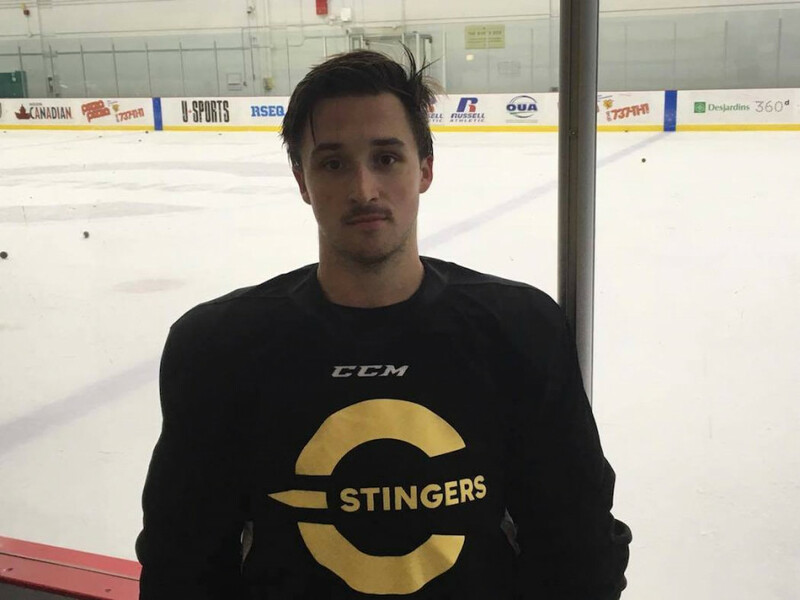 Concordia’s newest defenseman may be new to the school, but he’s no stranger to the Stingers’ coaching staff. Taken in the fifth round of the National Hockey League draft by the Vancouver Canucks in 2015, Carl Neill gained a reputation for being a good two-way defender in the Quebec Major Junior Hockey League for five seasons before joining the Stingers this year. The 21-year old was courted by programs across Canada. With his skill set, it is not hard to see why. “I think I’m a two way defenseman. I’m pretty solid defensively and I can chip in offensively as well. That’s how I like to see myself,” explained Neill. Neill certainly did more than just chip in offensively throughout his junior career. In 131 games over the last two seasons, he put up 119 points, a strong output, particularly for a defenseman as capable in his own zone, as Neill is. Already, Neill’s new teammates are seeing his talent translate into strong performances in the preseason. “You’d expect it from a guy coming from an NHL camp, he’s got that experience under his belt. He was pretty good in the QMJHL, so I expect no less, but so far I think he’s exceeded expectations,” noted Stingers captain Philippe Hudon. “[He’s] something to look out for. He doesn’t wow you with dazzling plays but he’s that type of guy that’s going to anchor our defensive core. He’s exceptional in that way,” continued Hudon. That impression extends past Neill’s teammates to his coaching and scouting staff as well. According to Stingers’ head coach Marc-Andre Element, one of the best parts about having the former Sherbrooke Phoenix captain on the team is Neill’s qualities as a leader and as a person. The Concordia head coach knows quite a bit about this as he spent the last year speaking with and recruiting Neill to the team. “It’s really important for us to have good leaders, good people and he’s just an amazing person and this is what we want in our program,” he said. As happy as the team is to have him, the road goes both ways for Neill who is enjoying his new school as much off the ice. With a team that he’s already gelling well with and a school environment that he’s been happy with since the start, Neill has no regrets about his choice. On a young team hungry for a stronger finish than last season, Neill’s goals are simple. In particular, he would like to be a “difference maker,” who will make his mark on the defensive end as well as on offence. That is exactly what the team expects from Neill. The hope is that he can be a positive force for the team right out of the gate this season. “I see him having an immediate impact for our team, playing big minutes, [making] the players around him better,” said Shemie, whose optimism for Neill is certainly shared by Element.